.. And, it’s done!! Mixed, Mastered and currently in constant rotation amongst myself, EVERYWHERE (laughing). 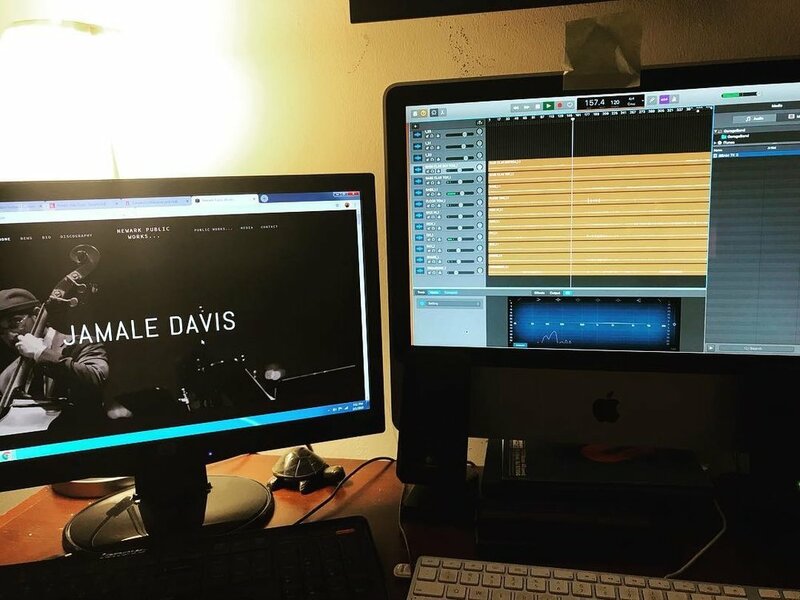 A little different process than my usual: I like to play the projects to myself for a year before anyone hears it- I tend to exhaust myself with the music before I present it to the public. This time I let a few dear friends- and great musicians- take it for a run, so far so good is the response. If you’re hip the personnel in the picture below then you already have a good idea of the potential sound of the album; for those unaware, please do some research, as you can find examples of these guys playing in various groups via youtube. The collective for this album presents such a unique sounding group aesthetic, one that I’ve been dreaming about since my second album (We Worked In The Bricks, STILL AVAILABLE!!!). The addition of the great John Mosca has just left me in such high spirits! What we were able to produce in a short time (five-hour recording session!) is something I can’t wait for the world to have an opportunity to dig. I plan to release this album much faster than any other project, the music demands it!!! The liner notes shall hopefully articulate the origins behind this, no big deal, but big enough that it needs some expression via words..
.. Until I have more to report, Peace To All The Workers!! Hey!!! Some exciting news to report: The new album has been recorded (on January 30th, to be exact) and is now being mixed and mastered by the great Walter Fischbacher (Lofish Studios lives!!). This next album is the result of me wanting to hear four of my favorite friends together on one record- four extraordinary musician that brings something uniquely their own on their respective instruments. The lineup is as follows: Stefano Doglioni on bass clarinet, returning for another stint is Stephen Riley on tenor saxophone, and joining us is my favorite trombonist and dear friend, the great John Mosca!!! With such a lineup, it is a pleasure to hold down the rhythm section along with my friend and partner in crime, Charles Goold on drums! These guys present such a unique sound to any band separately, so to have them together swinging just makes for an interesting project altogether. the tunes are ambitious enough to bring out the best in everyone, and if you know anything about these musicians you can only imagine what’s to come!! I’m excited and I hope this bit of news does something for you as well!! ‘NU’ WORK COMING SOON FROM GUT STRING RECORDS…!!! JOHN MOSCA/ TROMBONE, STEFANO DOGLIONI/ BASS CLARINET, DON HAHN/ TRUMPET, SALVO LOSAPPIO/ TENOR SAXOPHONE, FELIX LEMERLE/ GUITAR, SCOTT LOWRIE/ DRUMS AND YOURS TRULY ON DOUBLE BASS. YOAV IS SUCH A GREAT TALENT AS A TROMBONIST AND EUPHONIUM- IST (!!! ), BUT HIS SKILL AS A COMPOSER IS SO REFRESHING AND IS SIMPLY A JOY TO PLAY. I LOVE THIS ALBUM AND IT REALLY IS AN HONOR THAT ‘YO YO’ ASKED ME TO PARTICIPATE IN THIS PROJECT! 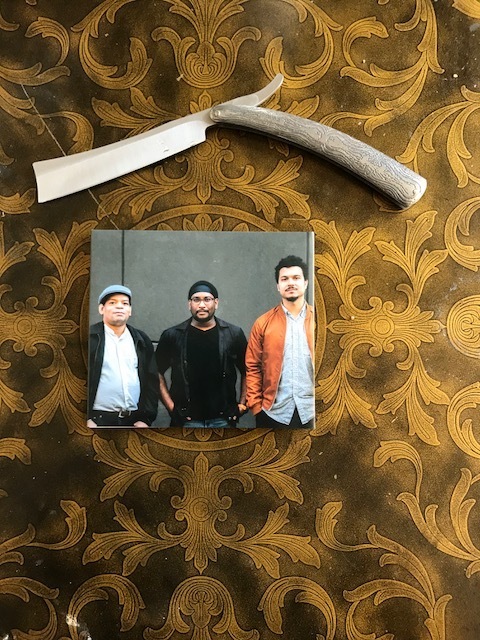 FEATURED VIDEOS ARE THE SACHA PERRY ORIGINALS THE FAR SHORE, BEEHIVE AND THE CLASSIC STANDARD LET’S FACE THE MUSIC AND DANCE..
... FINALLY, THE NEW ALBUM FROM THE SACHA PERRY TRIO, MORSE CODES FROM THE OPPOSITE LAND, IS HERE!!! RELEASED ON GUT STRING RECORDS, AND AVAILABLE DIGITALLY AND PHYSICAL COPIES ON CDBABY!!! THIS WHOLE PROJECT IS MORE THAN A LABOR OF LOVE: IT'S A CONVERSATION BETWEEN THREE BROTHERS; SACHA- WITH HIS ORIGINAL COMPOSITIONS- SETS THE TOPICS FOR DISCUSSION; ME AND CHARLES (WHO'VE BEEN HAVING OUR OWN FORM OF MUSICAL DIALOGUE SINCE 2005) ADD, SUBTRACT AND AUGMENT HIS POINT OF VIEW TO A COLLECTIVE EFFECT. TO THINK THAT SUCH A CONVERSATION CAN COME FROM A FOUR-HOUR SESSION (THREE HOURS REALLY- AN HOUR OF MIC/VIDEO SETUP..!!) WAS NOT INTENDED, EVEN THOUGH THE GOAL WAS TO SIMPLY PLAY WELL; THINK WE ACHIEVED OUR GOAL, AND MUCH MORE..
FOR THE TIME BEING, WE HOPE YOU ALL CATCH THE CODES, AND ENJOY...!!! MORSE CODES FROM THE OPPOSITE LAND...!!!! 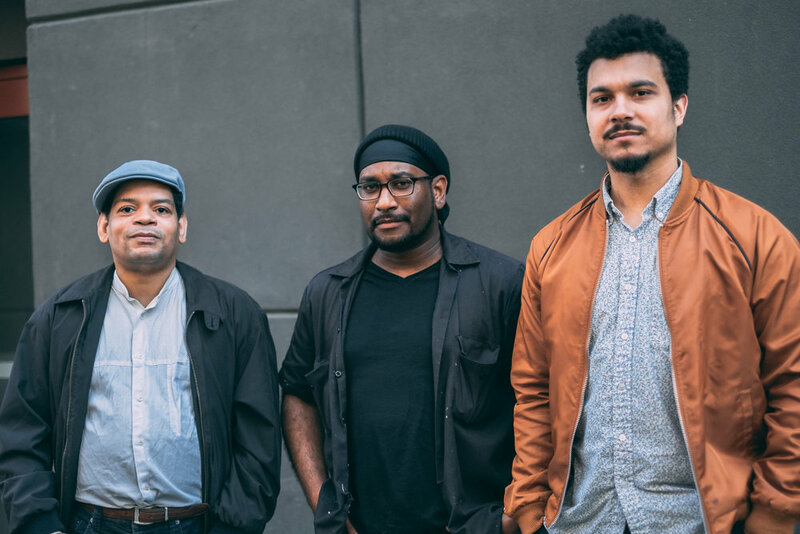 It looks like everything is moving rather quickly for the release of the album recorded August of last year: The Sacha Perry Trio presents a new album featuring all Sacha Perry original compositions. The album is titled, MORSE CODES FROM THE OPPOSITE LAND.. I'm so excited for everyone to hear this- me and the fellas have listened to this album for a great majority of the year of its incubation and it really holds its weight. I can assure you that no note was wasted, and Sacha is pleased with the results which (respectfully to the future listeners) is kinda the priority..
... More news to come soon, I'll keep you posted!!! The Work is finally here!! the new record, released on October 3, 2017,is called We Worked In The Bricks.. by the Jamale Davis Group, with special guest tenor saxophonist Stephen Riley!! In following the continuing tradition with each project, starting with the featured appearance of tenor saxophonist Ned Goold on my debut album titled Workers' Comp (released October of last year), the featured presence of Stephen Riley adds a sense of excitement that I'm so honored to document and share with you all! The combination of such unique tones that Stefano and Stephen provides throughout this album is worth spending some time digging.. The selection of compositions features the works of not only such acclaimed masters like Jackie McClean, Donald Byrd and Phil Woods, but we also 'work through the bricks' of tunes from some of my contemporary sources of inspiration like tenor saxophonists Chris Byars, Ned Goold and Pasquale Grasso. All gems if you ask me..
We Worked In The Bricks.. can be purchased at ITunes // CDBaby.com // Amazon.com NOW!! Check it out and I hope you enjoy the work!!! ... We Worked In The Bricks. 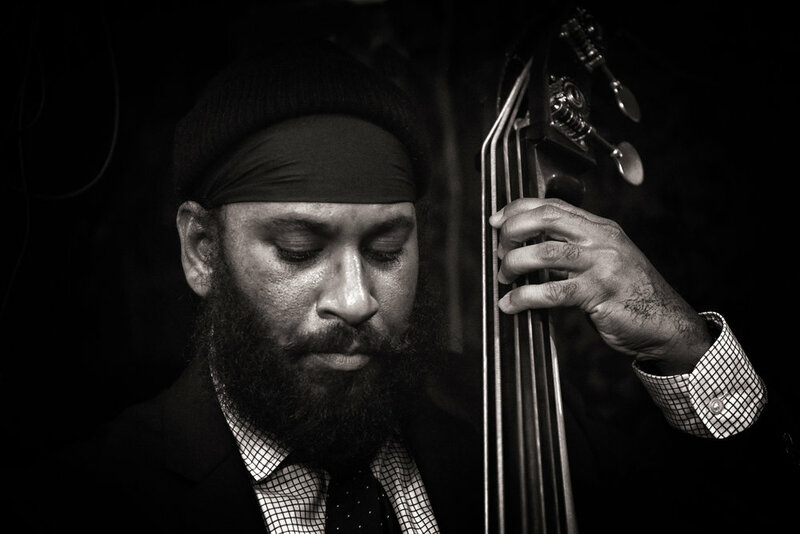 Born in Newark (raised in Irvington/ cultivated in both) New Jersey, Jamale Davis started started studying bass in 2003 as a means of actively understanding what it takes to express oneself via the art of Jazz. His studies consisted of playing along to records and teaching himself to read music, but his best education was once he started hanging at Smalls and Fat Cat, his musical home. 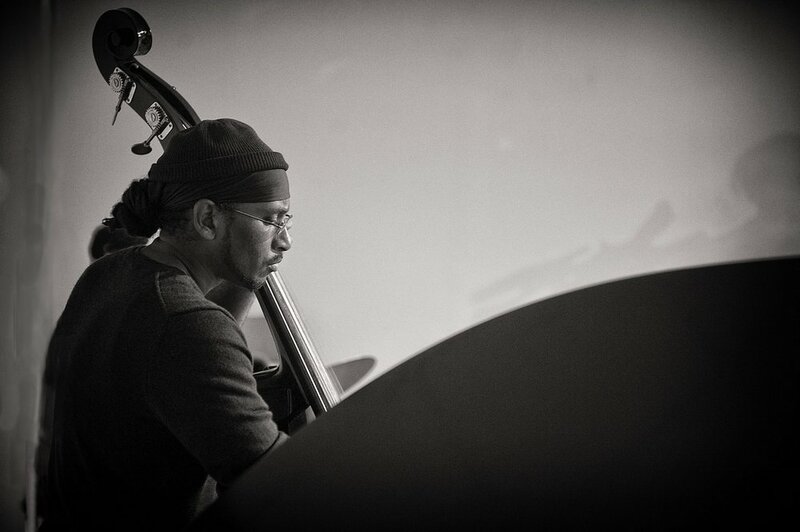 These places helped and inspired Jamale in the cultivation of his particular aesthetics to bass playing: the acoustic, non-microphone approach, gut string setup with a concentrated lean towards more straight-ahead bebop idiom translated in his repertoire and approach to everything musical.. Since 2012 Jamale has led his own group at various places in the nyc/nj area that consists of some of the best musicians on the scene today. This has also contributed to Jamale releasing his debut album on Gut String Records called Workers' Comp in October 2015 and his second album We Worked In The Bricks.. in October 2017. 9. Out Of Goold Redux..
MORSE CODES FROM THE OPPOSITE LAND..